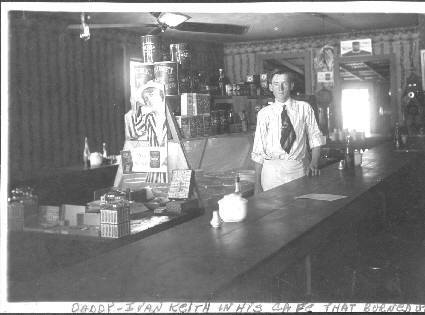 IVAN AIRS KEITH was born January 28, 1895 in Concho County, TX, and died June 02, 1966 in Brady, McCulloch County, TX. He was the second child born to WILEY H. KEITH and EMILY CATHERINE HOLLIDAY. 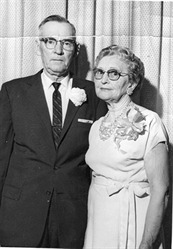 He married DOVIE LEE BLOUNT July 08, 1913, daughter of JAMES KOEN BLOUNT, Jr. and MARTHA DAVIS. She was born February 14, 1892 in Llano, Llano County, TX, and died December 25, 1992 in Mabank, Henderson County, TX. Their first grandchild called them MaMa and Dado and the names stuck with all grandchildren and great-grandchildren to come. 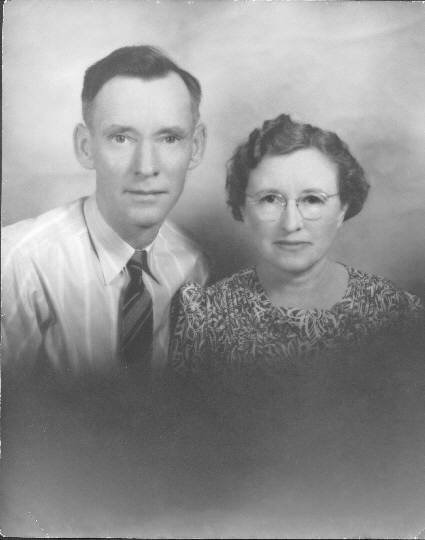 To her children, Dovie was forever called “Mudder.” Ivan was born Ivan Lacy Keith, but he did not like his middle name. So as he grew older, he began using “Airs” as his middle name (his grandfather on his mother’s side was Frank Ayres Holliday). 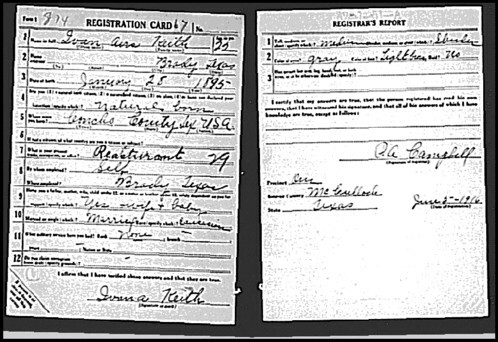 In fact, both his draft registration card and delayed birth certificate list his name as Ivan Airs Keith. Ivan was not called into the military. Dovie was a small sweet woman with a heart as big as Texas. She was a Valentine’s day gift to her parents and dearly loved by all for the nearly 100 years God loaned her to us. Ivan was a very versatile, motivated man; and seemed to be able to master any any task. He took up photography and made his own darkroom to develop his pictures when he was a young man. When he registered for the draft at the age of 23, he was the proud owner of his own restaurant. in Brady, TX. “I first met this man in 1946 about Feb, 13th at his home in Brady, Texas. I was calling on his youngest daughter, Gwen. 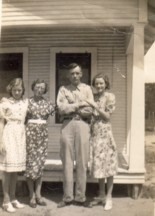 Ivan, Dovie, Ruth and Gwen had a couple of weeks before arrived back in Brady from Portland, Oregon where he and Ruth and Gwen had all worked in the same shipyard. Ivan had worked there as a machinist. Now he was back at his before the war job as a sheet metal expert, building water storage tanks and feeders for the farmers and ranchers around Brady. 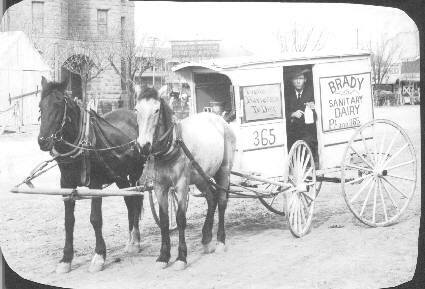 Before this, in early days he had his own dairy that he worked and was the first foreman for Metzger’s Dairy in Dallas. He was a good carpenter; and he also spent about a year repairing vacuum cleaners. Ivan only knew how to do any thing one way – Do it the best you can! They had two acres of land and a beautiful house on it and four huge evergreen trees. Ivan planted 8 ten foot pecan trees about this time. This past April, we drove by and you should see how they are now beautiful large trees. Ivan had two worm sheds and 9 worm beds. He raised African Night Crawlers and a small red wiggler worm. He dug these worms in the evening and put them in a pint Dixie cup in peat moss with holes in the lid. And he had a metal frame cooler he had made, with a locked money box on it. 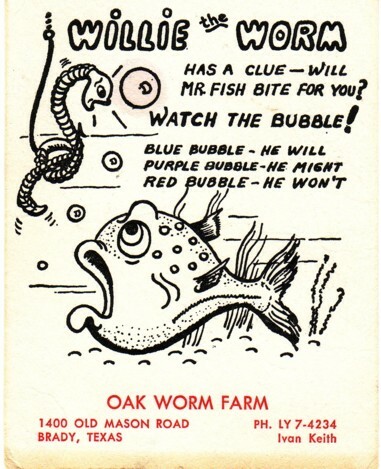 He sold 50 worms for 50 cents and people would come by going fishing and buy a box of worms and drop 50 cents in the box. One day someone took a box and did not pay for it. This really got him – he couldn’t believe anyone could steal a box of worms. He also raised white rabbits and white chickens, and he was good at it, plus he raised a good garden. His grandkids named him Dado and Dovie MaMa and from now on he was Dado. Ivan was a christian. I only knew this man for 17 years. He was my father-in-law and he was my friend. In memory of a good friend, father, grandfather, great-grandfather and a brother in Christ. Ivan and Dovie were buried in Resthaven Cemetery, Brady, McCulloch County, TX. MENDAL IVAN KEITH b. November 13, 1913; d. November 14, 1971, Brady, McCulloch County, TX. RUTH MARIE KEITH b. November 10, 1922 in Brady, McCulloch County, TX. FREDDIE GWENDOLYN KEITH b. July 10, 1925 in Brady, McCulloch County, TX.